HANNIBAL, Mo. — Missouri Attorney General Chris Koster is calling for a sharp increase in the state’s tobacco tax — now the nation’s lowest — to pay for a scholarship program to lower tuition at the state’s colleges and universities. Koster, who is running for governor in 2016, told several hundred Democrats at the regional Democrat Days that the financial boost for higher education could help counter the continued decline in state spending that has, in turn, forced tuition increases that increasingly are putting college education out of reach for many working-class families. “Higher education (spending) has been allowed to erode by about one-third since 2001,’’ Koster said, as legislators and state officials have redirected state spending to other priorities, grappled with the 2008-2009 economic downturn and approved tax cuts. Missouri’s educational and economic future is at risk if higher education spending isn’t addressed, he said. Koster’s pitch marked his first substantive policy speech since last fall and an apparent ramping up of his campaign, which has been low-key for months. Proposing a tax hike, he acknowledged later, poses some political risk. But Koster contended that increasing the state’s tobacco tax made sense and could attract public support, if it’s for the right reason. Since 2002, Missouri voters have rejected three different proposals for increasing the state’s tobacco tax – now 17 cents a pack – to raise money for various state spending proposals, many of them related to health care. Koster said he was flexible on how large of a tobacco-tax hike he would support, but he pointed to the 2012 proposal that would have increased the state's tobacco taxes by 73 cents a pack, which would have raised roughly $300 million a year. He emphasized that the proposal for hiking the tobacco tax for college scholarships originated with state Treasurer Clint Zweifel, a fellow Democrat who has been concerned for some time about Missouri’s decline in higher-education spending and its impact. Zweifel has proposed college scholarships to state schools for any student with a 3.0 grade average or above. Koster said he and Zweifel are working together to come up with a tobacco-tax proposal. In theory, the General Assembly could approve a proposal to put before voters. But Koster believes that legislators are unlikely to do so, and that an initiative-petition drive may be needed to get such a proposal on the ballot. Koster acknowledged in an interview afterward that his embrace of Zweifel’s plan means that the attorney general is revamping his own, earlier call to earmark part of any tobacco-tax hike to help Missouri businesses. The attorney general said he still supports those business proposals, but he plans to propose other ways to pay for them in the coming months. Koster also sought to use his focus on education to illustrate how, lately, Missouri state government has failed. In his speech, Koster explained that he has spent the last few months quietly visiting each of the state’s 20 community colleges to meet with top school officials and tour their campuses. The catalyst, said Koster, had been education-related legislation approved by the General Assembly in 1961. “I’m struck by the realization that once upon a time, a bipartisan decision made in our state capital created 20 colleges in the matter of a few years,” Koster continued. Koster reaffirmed his longstanding call for expanding the state's Medicaid program, as sought by the federal Affordable Care Act, saying that the expansion is "probably the best economic development proposal that has been placed on the table in 25 years." He cited Kentucky's recent report showing what a boon that Medicaid expansion has been for the state and its economy -- as well as to the business climate. 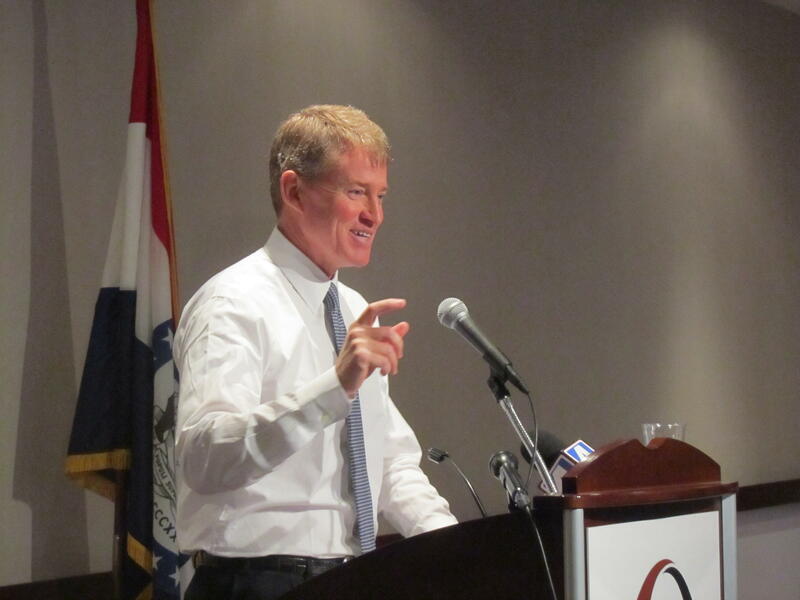 Overall, Koster's address Saturday was his first substantive policy speech since laying out his business proposals last fall to the St. Louis Regional Chamber. While emphasizing his support for aiding business, Koster indicated that he’s not keen on granting them additional tax cuts – a stance that appears to put him at odds with wealthy financier Rex Sinquefield, a tax-cut supporter who predicted last week that Koster would cut more taxes if he’s elected governor. Sinquefield had been a major donor to Koster in his campaigns for attorney general, although the financier has switched his allegience to Republican Catherine Hanaway for governor. Sinquefield has donated at least $1 million to her campaign. Koster said Saturday that while he supported the tax-cut plan approved by the General Assembly last year, he won’t support any additional cuts in the short term. Koster contended that the Republican-dominated General Assembly first must fully fund the aid program – called the “foundation formula’’ – for kindergarten through high school. That program is $500 million underfunded, Koster said, emphasizing that the current formula was crafted by Republicans a decade ago. The GOP’s failure to follow through with its own school-spending program is “short-sighted,’’ Koster added. Koster noted that the multi-year tax-cut plan approved in 2014 won’t begin going into effect until 2017. He said it was “way premature’’ to call for more cuts until it’s clear how the already enacted tax cuts affect the state budget and the economy. In that context, Koster noted that when the current foundation formula was adopted, he was one of the Republicans who voted for it. In 2007, he switched parties. Although Democrats continue to hold most of Missouri’s statewide offices, the General Assembly’s huge Republican majority highlights the rural edge that the GOP continues to enjoy. Saturday’s traditional morning press conference, featuring rural Democratic legislators, offered a stark illustration of the change. The news conference was held as scheduled, but no legislators showed up. That's because northeast Missouri no longer has any Democratic rural legislators. The few remaining holdouts were replaced by Republicans last November. Former state Auditor Susan Montee, a Democrat who hails from rural western Missouri, told Saturday's Democrat Days brunch crowd that she hopes to help turn things around. She was introduced this weekend as the chairman of Missouri Democrats' new rural caucus. “In rural Missouri, that’s where we’re losing,’’ Montee said bluntly. While some blame the 2011 legislative redistricting, which crafted a number of Republican strongholds, Montee told the crowd that more favorable district maps would still have left Democrats in the minority in the state House and Senate. “To take back the majority, we are going to have to get new Democrats,” she said. State Democratic Party executive director Crystal Brinkley, who’s originally from Milan, Mo., said the party is focused on bolstering Democratic organizations in each of the state’s rural counties and heightening the party’s rural profile. Koster, who has been playing a major role in revamping state Democratic operations, said the aim also needs to be “broadening the Democratic message and allowing for more flexibility” – especially on social issues such as guns and reproductive rights. Missouri Auditor Tom Schweich launched his campaign for governor by lashing out at the man who he says is a symbol of the “rampant corruption” in the state Capitol -- wealthy financier Rex Sinquefield. 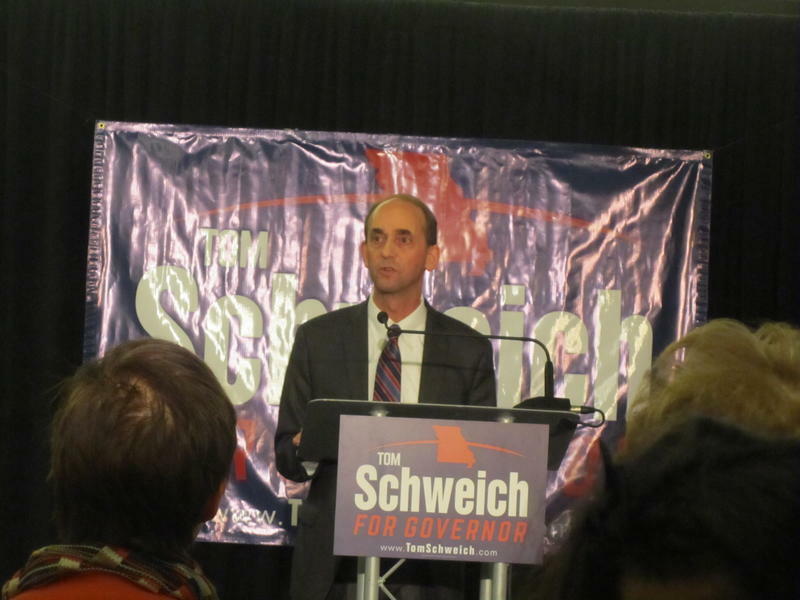 Schweich said that Sinquefield, the state’s top political donor, has been engaging in “corrosive tactics’’ with “an army of mercenaries.’’ Their aim, he said, is to advance proposals – such as the elimination of Missouri’s income tax and replacing it with a huge sales tax -- that he says would help the wealthy but hurt small business and middle-class Missourians. Missouri Attorney General Chris Koster is proposing that the state’s voters be asked once again to increase the state’s tobacco tax, now among the nation’s lowest. But instead of previous failed proposals that would have directed the bulk of the money raised for health care programs, Koster would use the estimated $400 million a year primarily to pay for state incentives to improve the business climate and attract more jobs.